Villa Delfin Sol is all about the location. The beautiful sandy beach, shops and restaurants of Matagorda are all within 10 minutes' walk. The lively Strip of Puerto del Carmen, with a huge number of shops and restaurants, as well as nightlife, plus the long sandy beach, are all within 5 minutes' drive. What's more, this property has a private pool and delightful sea views. Air conditioning/heating in the bedrooms and lounge, WiFi and pool heating are included. The fantastic location and lovely sea views coupled with homely interiors - the best of both worlds! Outside, the villa has a private swimming pool with Roman steps for easy access and plenty of space to relax and enjoy the Canarian sunshine. There is a shaded pergola plus a table and chairs, which are perfect for dining alfresco in respite from the sun. From the pool terrace you can enjoy views over the surrounding area, mountains and sea and even across to the islands' capital, Arrecife! A steep shared driveway leads around the house to a private parking area for this villa and its' 2 neighbours. A gate opens onto the pool terrace with the main entrance on the far-right hand side. The lounge has comfortable seating and is open plan with the dining area. There is a large window framing the magnificent sea view. 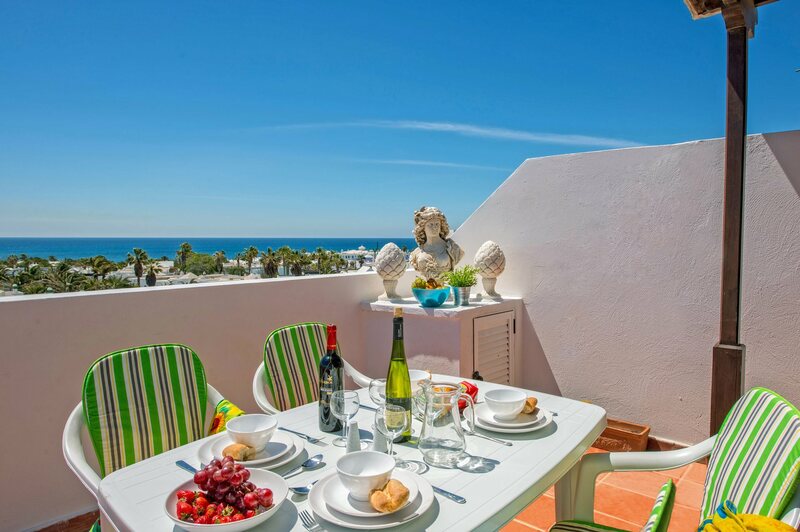 The compact and fully equipped kitchen is adjacent and has views over the pool terrace. The double bedroom has ample wardrobe space and views of the mountains and Arrecife. Adjacent is the separate bathroom. At the end of the hall is the twin bedroom with an en suite shower room. Villa Delfin Sol is a semi-detached property in a brilliant location by the Morromar Apartments, within a short walk of the centre of Matagorda. There are a number of shops and restaurants as well as the sandy beach situated parallel to the main promenade. If you are after some retail therapy the lively Strip of Puerto del Carmen is 5 minutes' drive away. This is the perfect place to sample local and international dishes - you will be spoilt for choice. The commercial centre of Matagorda, with a good number of shops, is a 10 minute walk away from Villa Delfin Sol. There are more shopping opportunities in the neighbouring resort of Puerto del Carmen. The Biosfera Shopping Centre has many fashion outlets, bars and restaurants. There is a weekly market in Puerto del Carmen Harbour on Fridays and a Saturday market in the chic Puerto Calero Marina. The island's largest market is held every Sunday in the ancient capital of Teguise. The centre of Matagorda, as well as the promenade, are both a 10 minute walk from Villa Delfin Sol. Here you will find plenty of places to eat including typical tapas bars and traditional cafes where you can take a break from sunbathing on the beach for a drink or have lunch overlooking the sea. The closest beach to Villa Delfin Sol is Matagorda Beach, which is within a 10 minute walk. Alternatively, the beach in Puerto del Carmen is around 5 minutes away by car. The villa is also close by to several alternative excellent beaches, including Pocillos and Jameos Playa beaches. You can enjoy a great family day out at the Rancho Texas Animal Park which has regular shows featuring parrots, birds of prey and animals from all over the world including seals and pumas, and there is also a petting zoo. By night it transforms into a cowboy themed show with a BBQ, line dancing and games. Alternatively, the Aqua Park in Costa Tequise is only 15 minutes' drive away. The old town of Puerto del Carmen is just 5 minutes away by car or local bus and has a square, which hosts all the local fiestas in summertime, surrounded by more traditional bars and restaurants catering for all tastes. Boat excursions along the coast, and further afield to the neighbouring island of Fuerteventura, sail from here. There is an 18-hole golf course a 5 minute drive away, located just behind Puerto del Carmen. A more established course is also available in Costa Teguise. A pitch and putt course is in the Hesperia Hotel in Playa Blanca. For keen walkers, the coastal walkway eventually takes you into the capital of Arrecife, passing the airport, various rugged beaches and the Deihland Commercial Center where there is a bowling alley and high street shops. Villa Delfin Sol is not available to book for season as it is sold out. Take a look here at the Lanzarote villas that are currently on sale. Great location for views, villa met my expectations and all the amenities worked perfectly. Overall, we had a wonderful week away, roll on the next one. The villa is in an excellent location and the pool was great. The whole process from booking the villa,the flights and transfers were all excellent, all very smooth. Would book another villa with Villa Plus. It was a great villa, from now on that's at the top of our list and to try new places with Villa Plus! Thoroughly enjoyed the Villa Delfin and intend to return next year.